I think it’s good to demystify art. So often we see final art and unconsciously assume it all came easily, that the creator must be a genius, specially gifted, etc, etc. The truth is, the process is often messy– at least for me. I could see a number of problems. The musical notes don’t make sense. A podcast usually involves instruction or discussion; they’re not music programs like you’d hear on the radio. The proportions are wrong: a pea pod is a lot smaller than your average eggplant, for example. A giant pea pod doesn’t make any sense. And the orientation is off: the tomato is facing in a different direction than the other veggies. I also thought the carrot should be taller, to better frame the right side of the drawing. Finally, I wanted to do something more ambitious than just a simple cartoon with a spoken caption. Biggest changes: the pod’s much smaller, the broccoli’s gone, the tomato’s now facing the same way as everyone else, the carrot’s taller, and the entire veggie group has been moved back so it’s slightly behind the pea pod. I did the original sketch on paper, but I do all my line revisions directly in Photoshop. I’ll use the Pen tool if I need to draw an additional line, but I’ve found I can usually copy and paste bits and pieces of existing lines to get what I need. For example: the tomato’s new eyes are simply dupes of another vegetable’s eyes. And the tomato’s new smile is simply his old smile flipped horizontally and rotated a bit. I wrestled with the concept for several days– where was I going with this?? 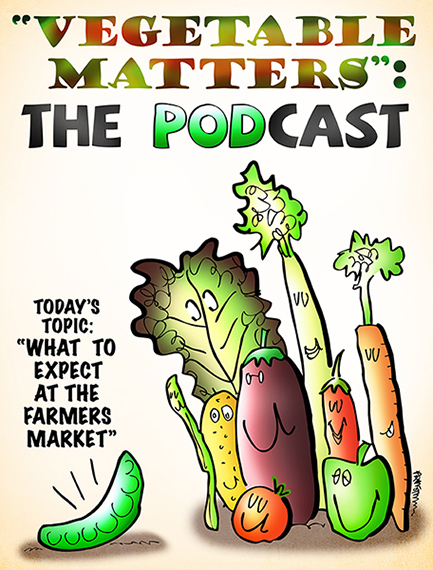 Finally I thought of the term vegetable matter, and I had my solution: a program called Vegetable Matters that would discuss topics of interest to… vegetables. Believe it or not, the really hard work was done: an idea that works, and a drawing that works. The rest was a series of color experiments and Photoshop techniques. A lot of time and effort, sure, but I knew I was on solid ground. I know what you’re thinking: could I buy a print for all the geeks and vegetarians on my Christmas list? Absolutely. It’s available on my Fine Art America website. I don’t listen to too many podcasts– how about you? Did you realize vegetables are intellectually curious before reading this post? Do you still love me even though I’m not perfect?? Hope you’ll leave a comment. If you enjoyed this post, please click the Like button below. If you’d like to share this post with others, please click Tweet or Facebook or StumbleUpon or one of the other Share buttons. I also invite you to get updates. Just click the Get Updates button in the sidebar below the Portfolio Thumbnails, or click + Follow in the blog menu bar. Is It Too Late To Wish Everyone A Happy New Year?? What Kind Of Man Inserts Himself Into Old Print Ads?? Ha! Your opening line– You had me at spilling the vegetables– made me laugh with joy! Thank you, dear Lily, you sweet person, you. Thanks for that lovely comment, and your wonderful support! Love your podcast post. To answer to your question – no I don’t listen to pod casts but now I’m beginning to wonder if I should? Can anyone enlighten me, please. Thanks so much, Maria, very glad you enjoyed the post. Your comment made me curious, so I simply googled “list of podcasts,” which returned a lot of links. Here are two in particular that seem very helpful re what’s available. Give ’em a click and start exploring! Thanks Mark, will have a look now. Art is a process, as you well know, and I fully understand that the process isn’t mistake-free, and it doesn’t flow without some effort. What I think matters is the final product, and I really like what you’ve done here. Ah!– a most gracious comment, Jak, thank you. Yes, it’s funny: one can grind away, putting in a lot of time and effort on piece, but it all seems to fall away if things come right in the end. If you’re happy with the result, you forget the blood, sweat, and tears it may have taken you to get there! Those are your deep dark secrets? You’ll never rise to the level of tormented Goth with that, Mark! 😀 Nice illustration, I’m glad it had some color in the end. Really bought it to life. And yes, I downloaded all sorts of apps. Never had plans to pay until I discovers instructional podcasts. Now I’m relearning 2 languages, learning Chinese for the fist time. Addicted. My friend paints dark scenes, he grew up n a town where a bunch of kidnappings took place and everyone lived in fear. Definetly affected his art. Is genius stuff. One’s upbringing and environment must surely impact an artist’s sensibility. And one can’t help but marvel at how pain and dire circumstances can sometimes produce beautiful art. Good to see you, Amelie, many thanks for your comment! You, not perfect? Mock all you like, I do not believe you! Perhaps someday I’ll be almost as popular as this wonderfully talented painter. 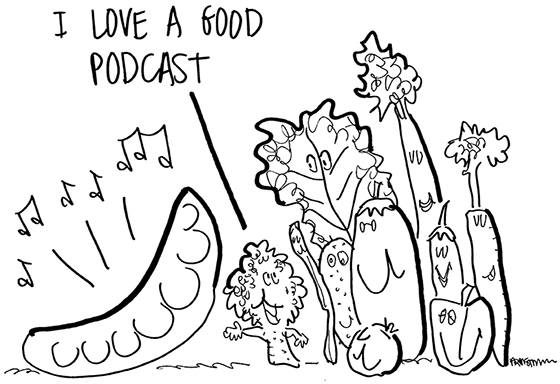 Thanks for sharing your creative process Mark, and no, I did not realise that vegetables were intellectually curious, who knew! 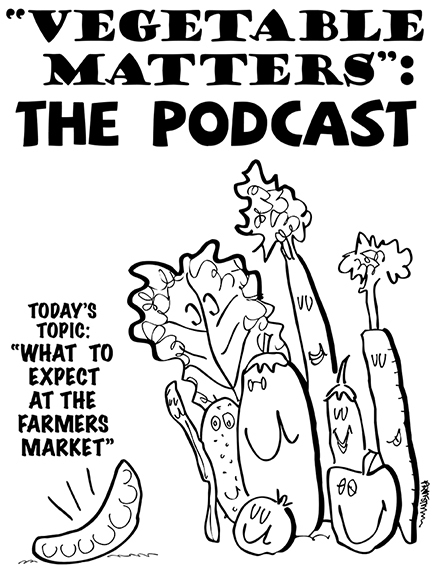 Yes, you’d think by now the intellectual curiosity of vegetables would have attracted more attention. I got another reminder of it recently while I was grocery shopping. I always bring some weighty philosophical work with me (in paperback), so I can improve my mind as I roam the aisles looking for candy, cheese curls, and other health foods. As a sometimes “would be” illustrator and a fledging writer, I know the feeling Mr. Armstrong speaks of. I was a fine arts major in college, but went on to do other things non-art related. I recently began again to draw and it is like coming back to a true love that one has to become re- acquainted with. Many thanks for your comment, wishing you all the best! I like the final poster product! It became a wonderful more mature fun idea with the right slogan. And no I don’t listen to any podcasts. I wish I could see the long haired white wild mountain goats in our Rocky Mountains. I don’t think little me scares them..I have to get to their rocky high corner lst. To paraphrase the movie, “Casablanca:” “I am shocked, SHOCKED, to learn (that Mark Armstrong ever made a mistake).” Signed, stunned fan who still adores your creative and humorous illustrations. Even though you have demystified the process, I do love that final illustration. Thanks for your kind words and truly wonderful support. Here’s lookin’ at you, kid!! Reblogged this on Coloring a Monochrome Life. I was the copy doctor for a book by Rosie Battista called Cooking Naked After 40….she says a lot about vegetables….I definitely think they deserve more press. Being privy to the process is always so fascinating, Mark. I shall order several for my wall 😀 – While you were so right to remove the musical notes, I saw nothing wrong to begin with, nor did I with the size of the pod and that is why you are your best critic!